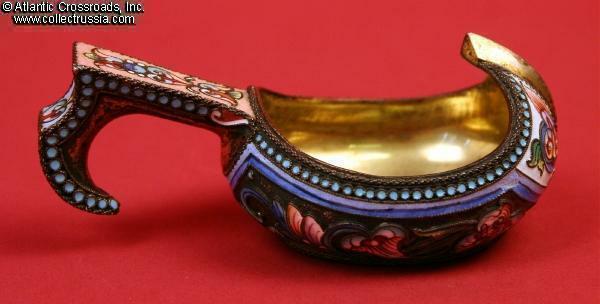 Moscow-made Silver Gilt Kovsh with exquisite Shaded Cloisonné Enamel, C 1899. 86.18mm long and 48.75 wide. Weight: 52.3 grams. 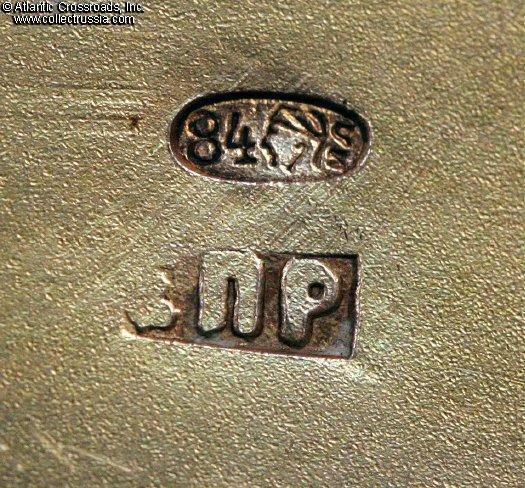 Two circa 1899 hallmarks: an "84" silver kokoshnik head oval stamp with the initials of Assaymaster Ivan Sergeivitch Lebedkin and the hallmark of an unknown silversmith: "_ P R" (in Cyrillic letters, the first letter is unfortunately not legible). 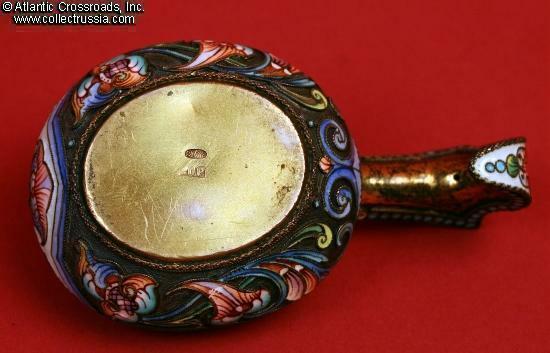 Shaded enamel floral design on stippled silver- gilt ground. Very fine to excellent condition. There are three places where the enamel has flaked. One is in a blue area close to the "prow" of the kovsh. 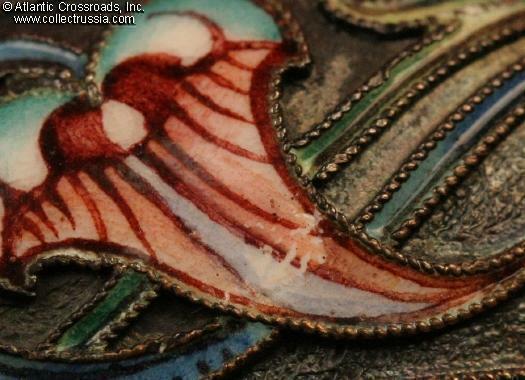 The second is about 1cm away where the enamel has flaked off and now registers as an area of white (this actually looks like a part of the design and is not in the least detractive). 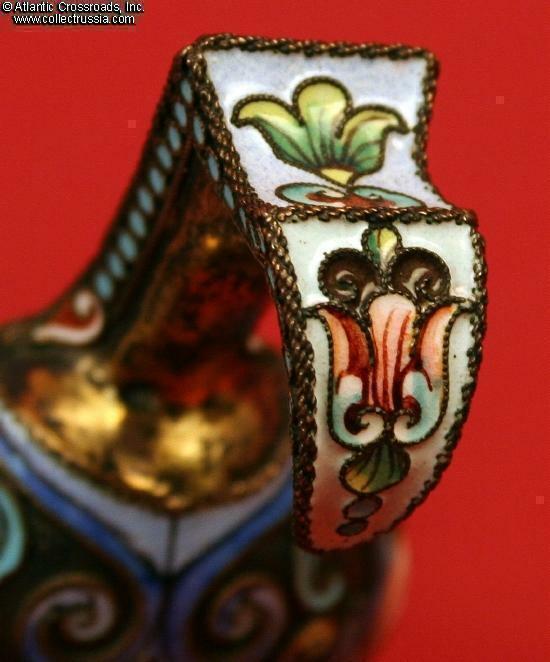 On the same side of the kovsh, in an area of salmon pink and white coloring on one of the orchid-like "flowers", the enamel has flaked slightly and there are now two or three tiny white lines in the enamel's surface. 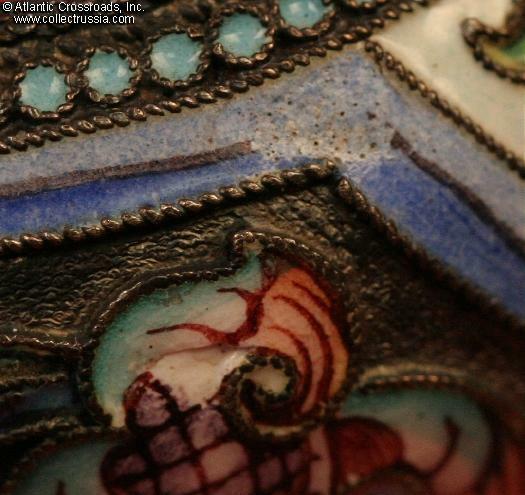 Of the three areas, only the imperfection in the blue enamel is immediately noticeable (and even then it is not located at a point where the viewer's eye automatically gravitates toward it). By the early nineteen century, civil merit or military valor began to be far more commonly rewarded by the presentation of a medal or induction into an order. Ancient forms of Russian art, however, were not forgotten but experienced a strong revival in the second half of the century, particularly in Moscow. 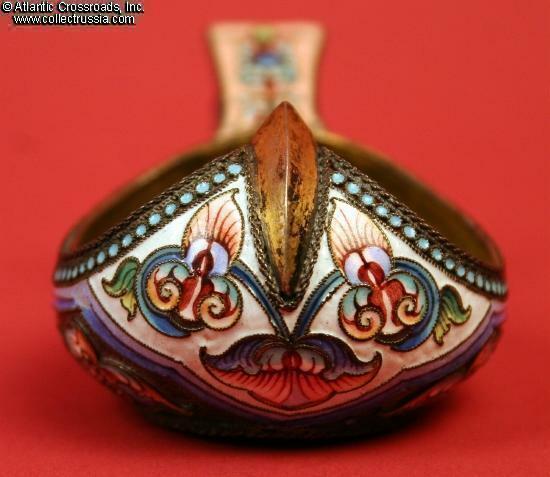 While there had always been occasional attempts to create objects that seemed "Russian" in nature, between 1850 and 1900 there was a wildly popular art movement that specifically inspired artists to express themselves in ways that evoked the ancient traditions of Russian folk art. Refered to as the "Russian Style", it saw the production of a vast number of objects that deliberately evoked the Russia that existed before Peter the Great's reforms. The style was popular all across the nation, but in some areas like Moscow, it influenced artists and jewelers right up to the 1917 revolution. 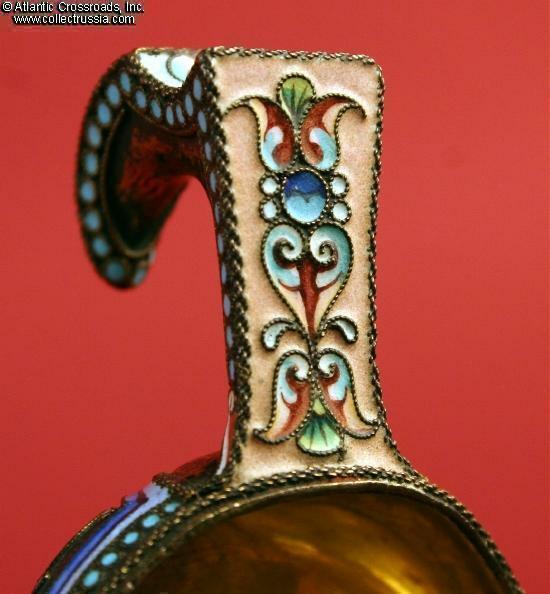 (Any book about Faberge will point out that his firm sold far more objects in the "Russian Style" in its Moscow branch than it did in its St. Petersburg showroom.) Sometimes, the desire to create items for daily use in a Russian folk art style resulted in products that bordered on the bizarre, like the famous samovar that looks like an overgrown and almost psychedelic rooster! 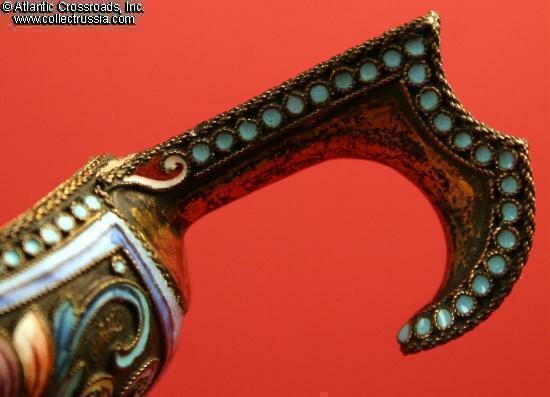 When applied to items like this kovsh that were already uniquely Russian in style, however, the end result was frequently - as here- quite beautiful. This atttractive kovsh was intended for actual use. 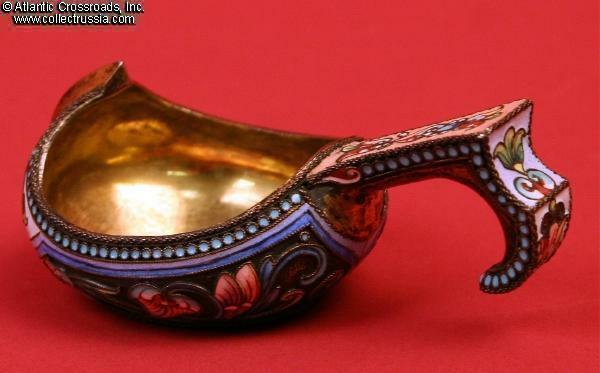 While some were undoubtedly collected in much the same way that people in England and America once displayed souvenir cups and saucers in their dining rooms, the fact remains that people expected to use these not only to look at and admire but also to drink from. 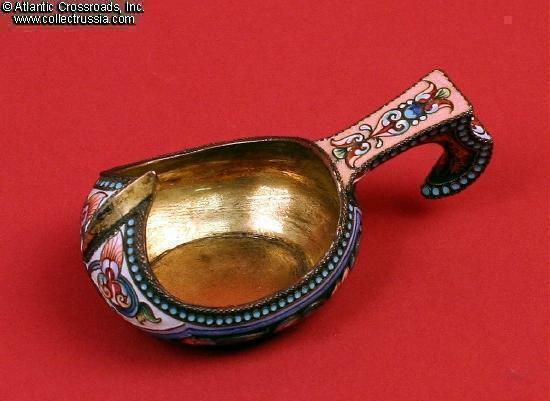 Some Russian firms even produced large kovsh-shaped punch bowls that came with as many enameled cups as the customer wished to buy in order to make a "set". 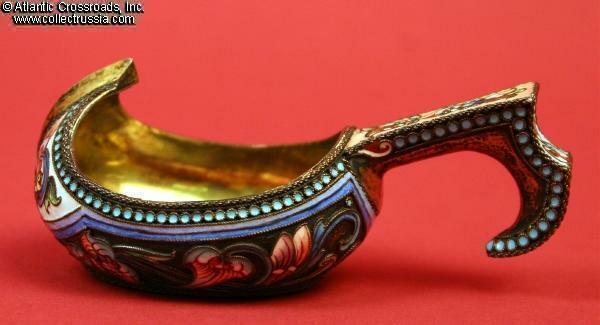 This is an exceedingly attractive example of pre- Revolutionary art and a particularly nice example of the famous technique of Russian "shaded enamel".